So will read the tombstone of Lone Star, a show that was praised by critics as the best of the new crop this fall season. According to EW.com's Michael Ausiello, FOX has just made the decision to cancel the series after only two episodes due to more-than-disappointing ratings. Though it wasn't include in my Fall 2010 TV Lineup as I am admittedly bad at watching TV dramas, last Monday I made a last minute decision to tune in to the freshman series. The story of con man Bob Allen struggling to balance two dishonest lives and get out of his life of lies had me instantly hooked and I ate up the pilot like sweet candy. 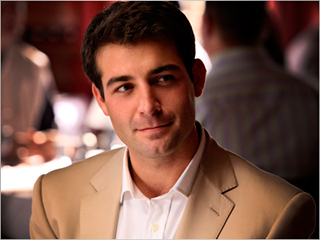 Lead man James Wolk was handsome and charming (and often without shirt) and managed to pull off one helluva tearful breakdown scene without making it look cheesy or forced. Wolk was joined by a great cast - most notably Jon Voight as Bob's millionaire father-in-law/target Clint Thatcher and David Keith as Bob's con artist father John Allen - that was just starting to scratch the surface of this story. Now we'll never know if sister-in-law Gretchen pulled back the curtain on Bob's lies ("Come to Greenfield High School...son" was a fantastic moment in last night's episode), who John called to assist him in going behind Bob's back for a con, and how exactly Uncle Roy died (my eye is on you, Clint). We can only hope that FOX releases this show on DVD with the unaired episodes - please, oh please! Let's all say a fond farewell: Goodbye, Lone Star. We hardly knew ye.